Is your organization interested in helping DPS Go Green? Contact us to see how you can help! DPS Go Green needs your help! Donate now and help pay for project supplies like light meters watt meter, food for events, and t-shirts. Contact Emile Lauzzana for more details! The Office of Energy and Sustainability oversees utility accounts with vendors for electricity, natural gas, district steam, water and sewer. Management of these accounts includes tracking usage and cost, auditing, rate optimization, and vendor negotiations. The Office of Energy and Sustainability is also engaged in energy savings initiatives in our schools including the DPS Go Green Challenge. How we use energy in our schools greatly impacts the district’s bottom line, which includes not just financial stability, but also student achievement and community well-being. By working to improve environmental factors—including thermal comfort, lighting, sound, and air quality – our students will be more comfortable in class and better able to concentrate on learning. Not only does the school environment effect learning outcomes, but it also effects student health. When our students are healthier, our communities are healthier. 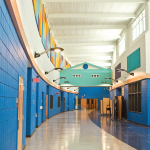 To learn more about how green buildings can improve student achievement, click on the American Federation of Teachers report: Building Minds Minding Buildings: Our Union’s Roadmap to Green and Sustainable Schools. Detroit Public Schools is developing a comprehensive Sustainability Management Plan (SMP). As the plan is developed, we are concurrently implementing best-practices in green and sustainable school management. There are many challenges in greening our schools – but for the sake of our students we need to move ahead now implementing best-practices that reduce costs, benefit our community, boost student achievement and prepare our students for the jobs of the future. The construction of 7 new schools to LEED green building standards. These schools use less energy and water and provide more natural daylight, healthier indoor air quality and better acoustics for learning. Launching the DPS Go Green Challenge a voluntary opportunity for schools to reduce their energy costs and share in the savings through engaging students, faculty and staff in best-practice energy management. Negotiating with Detroit Edison to operate 800 kW of solar energy facilities at 2 DPS schools. The solar leases will generate $480,000 in lease payments to DPS and generate enough green electricity for over 150 Detroit households for 20 years. School Nutrition Improvements recognize that healthy bodies make healthy minds. 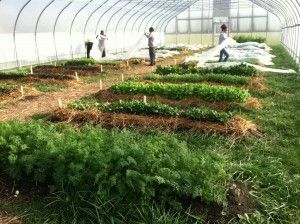 Some key aspects of these improvements include: no fried foods, no pork, whole grains, local produce, and meatless days. Office of Energy Management has recovered $195,000 in billing errors from utilities and is constructing a robust tracking and auditing systems with EnergyCAP utility management software. EnergyCAP has twice been recognized by the US Department of Energy as an Energy Star Partner of the Year. The DPS Go Green Challenge is a voluntary opportunity for schools to reduce their energy costs and share in the savings through engaging students, faculty and staff in best-practice energy management. 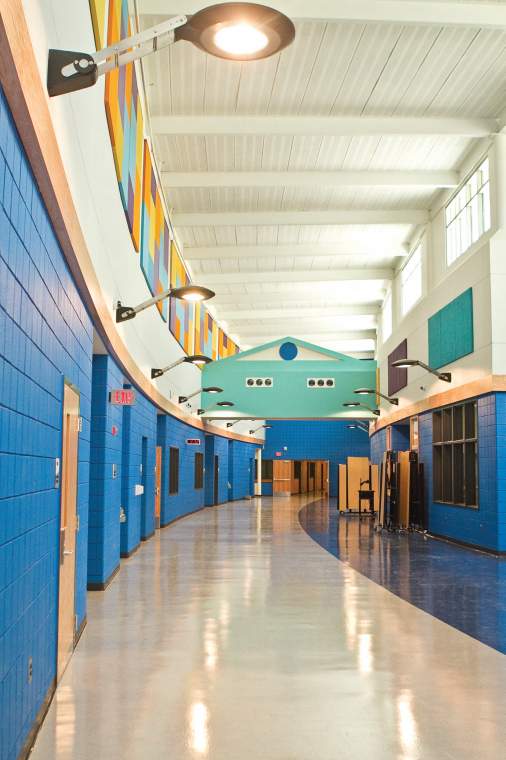 The U.S. Department of Energy and U.S. Green Building Council estimate K-12 schools can save 5-15% on their utility expenses through no-cost behavioral changes made by building occupants. This savings could translate to over $1 million annually for DPS, providing additional resources for education. This is equivalent to over 10 new teachers! The 50-plus DPS schools participating in the DPS Go Green Challenge have nominated a school Sustainability Coordinator and formed a Green Team comprised of students, faculty and staff. 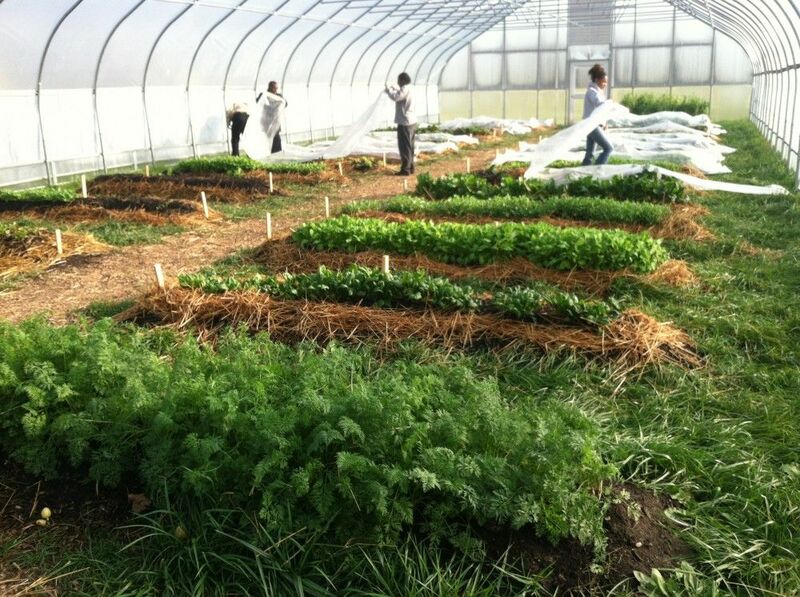 The Challenge encourages participants to engage sustainable and green practices that boost student achievement, increase the district’s financial stability, and have a positive community impact. All schools have created a unique name for their Green Team. 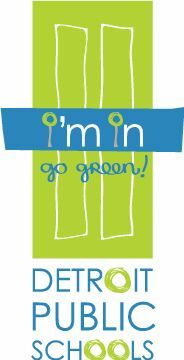 During the 2012-2013 DPS Go Green Challenge, DPS partnered with the Detroit non-profit WARM Training Center. Through this partnership, DPS Go Green Challenge Schools had the opportunity to be supported by AmeriCorps Green School Coordinators. Each DPS Go Green School was assigned two AmeriCorps Green School Coordinators to guide and support them throughout the Challenge. Learn more the AmeriCorps Green School Coordinators serving at DPS. A series of Energy Savings Workshops were presented by WARM Training Center and Detroit Parent Network. The 45-minute workshops provided participants an opportunity to learn how to take control of their energy bills. 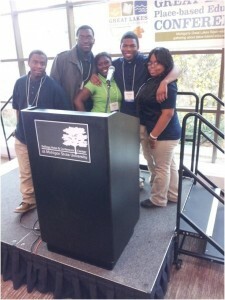 The workshops were led by professional Energy Educators and AmeriCorps members from WARM Training Center. 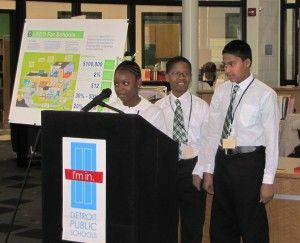 The DPS Go Green Challenge projects serve as a framework to help schools lower their overall energy use. Each project addresses occupant behavior and buildings systems – fostering a holistic energy management approach. In the spirit of promoting sustainable and green education for everyone, DPS has chosen to share these materials under the Creative Commons Copyright License Attribution-Noncommercial-ShareAlike. Read the Copyright License. 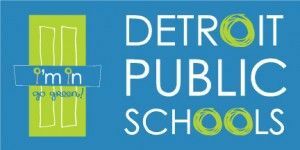 As part of the annual “Green Weeks” in Detroit Public Schools, the district announced that it is utilizing $150,000 of up to $1.8 million in energy tax credits to plan and design energy efficiency projects at 10 schools. This will in turn help reduce operating costs at those buildings and vastly improve the learning environments for thousands of students through superior lighting, improved thermal comfort and better air quality. Additional schools will be targeted for energy efficiency assessments and upgrades with the remaining tax credits. The projects will include swapping of incandescent and florescent lighting with LED lighting and replacing of older, inefficient boilers with modern, efficient digitally-controlled equipment. “These tax credits translate into real dollars that partnering companies are using to design high-quality, sustainable educational environments for our students. Building upgrades will result in lower annual operating costs and environmental impacts. Upgrades will include new thermal comfort systems, better indoor air quality equipment, energy-efficient lighting and more effective control systems that create an academic environment conducive to student teaching and learning,” said Roderick Brown, Chief Strategy Officer and former Executive Director for the 2009 Bond Project. As a tax-exempt entity, DPS can allocate credits and rebates to design and construction firms involved in the 1994 and 2009 bond program for consideration to offset future professional fees and costs related to capital improvements. DPS is eligible for up to $1.8 million in tax credits and energy rebates as part of the IRS Section 179D and other efficiency improvement programs for capital improvements made between 2005 and 2013. The schools expected to receive energy-efficiency improvements are Bates Academy, Bow Elementary-Middle School, Burton International Academy, Carstens Elementary-Middle School, Dixon Educational Learning Academy, Harms Elementary School, Mason Elementary-Middle School, Nichols Elementary-Middle School, Pulaski Elementary-Middle School, and Spain Elementary-Middle School. The first-ever Rainbow Plate Challenge – This initiative by the Office of School Nutrition and the Office of Science challenges students and staff to eat healthy fruits and vegetables representing all colors of the rainbow. The first-ever DPS Healthy Recipe Cook Book – The Office of School Nutrition will release a cookbook of healthy recipes compiled by 50 DPS students and staff. Green Weeks Photo Contest – Staff and students will be asked to submit photos of themselves “going green” and compete for prizes by submitting them to the DPS Go Green Team and on Facebook. Green Parent Workshops – Hosted at the Parent Resource Centers in partnership with the Detroit Public Schools Office of Science and the Office of Energy Management, a variety of partners and agencies will offer an array of topics including Home Energy Savings; Recycling and Composting; and Healthy Cooking. Parents will be able to participate in make-and-take activities with their children. Green Living Science will host “Fun Recycling Activities!” with make-and-takes that include T-Shirt Bags, Bird Feeders, and Plarn, a type of yarn made from recycled materials. Greening of Detroit will host “Taste the Rainbow: Food Sampling & Fun” with make-and-takes such as a Rainbow Plate, Recipe Cards, and a Rainbow Smoothie. 2nd Attention Strategies will host “Cool Composting & Cooking!” with make-and-takes that include how to build a Solar Cooker to use at home, how to create an Indoor Garden and how to build an Energy Savings Device. EcoWorks and THAW are partnering for an “Energy Saving Workshop.” EcoWorks will teach low and no-cost ways to lower a home energy bill and provide free materials to help participants save energy at home. THAW will be available for billing assistance. DPS Go Green Challenge – In conjunction with the DPS Office of Energy and Sustainability and partnering agency EcoWorks, schools again will participate in Detroit Public Schools’ (DPS) “Go Green” Challenge, which was established in 2012 as a call to action for all schools in the district to become more green and sustainable. The DPS Go Green Challenge focuses on four areas of impact: energy and water conservation; recycling and resource management; gardening and nutrition; and innovation. Schools again are engaging in DPS Go Green Projects and Contests – and creating ways to celebrate going green at each school. Last school year, DPS Go Green schools saved $395,000 in energy costs – earning those 34 schools $30,000 in incentive awards. Adding to “Green” success, 23 schools and 10,000 students also started recycling, and 17 energy-saving parent workshops were held. In addition, DPS schools completed over 100 green projects at schools – from planting gardens, to energy audits, and many more. 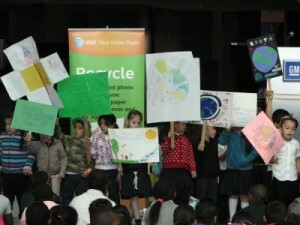 This year schools have already completed over 200 DPS Go Green Projects. Green Weeks activities will contribute to the DPS Go Green Challenge which last year saved the district $390,000 in utility costs through conservation and efficiency. Results of the challenge will be celebrated at the DPS Go Green Challenge Award Ceremony, Wednesday, May 21, when the district will be awarding $25,000 in incentive prizes to the leaders in the energy and water savings, recycling, and healthy eating challenges. DPS also is demonstrating its commitment to quality, healthy and sustainable learning environments through its ongoing LEED (Leadership in Energy & Environmental Design) certification pursuits as part of the 2009 Bond Program. According to the U.S. Green Building Council, LEED is a green building certification program that recognizes best-in-class building strategies and practices. To receive LEED certification, building projects must satisfy prerequisites and earn points to achieve different levels of certification. A week-long series of project launches, activities and public tours occurred November 26 – 30 to showcase the green initiatives! Green Apple Community Fair including group tours of new East English Village Preparatory Academy. Home weatherization demos by Detroit’s WARM Training Center in conjunction with DPS and Detroit Parent Network. Drew Transition Center Community Garden and Hoop House Tours with healthy salad cooking demonstration. Randolph Career and Technical Center students held a a DIY home improvement demonstration. More details: Build a Raised Garden Bed Class. Golightly Career and Technical Center’s Mass Media Program offered an ink cartridge drop off. Weeklong: Student Scavenger Hunts with Green themes. 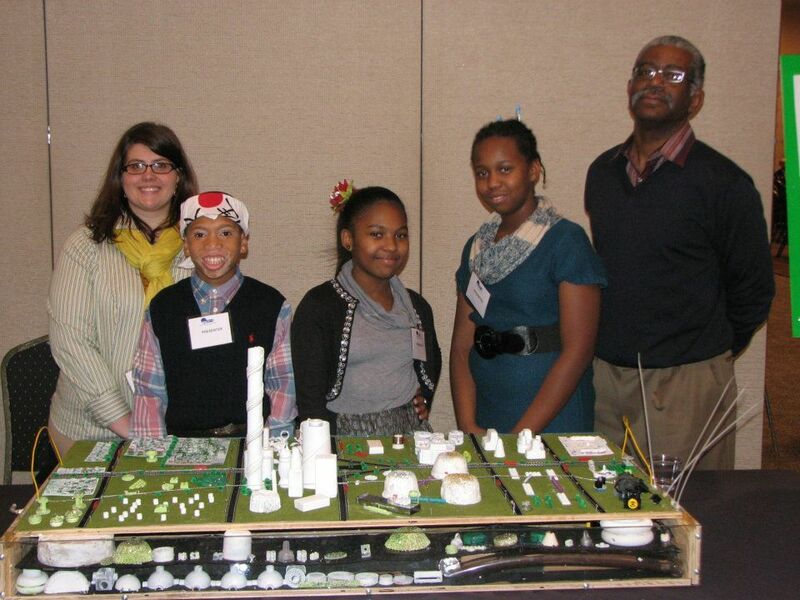 November 26, 2012 – Detroit, MI – On Monday, November 26, 2012, the Go Green Week kick-off event was held at East English Village Preparatory Academy. District representatives, Energy Educators and AmeriCorps members from WARM Training Center, as well as students, spoke about DPS’ Green initiatives. 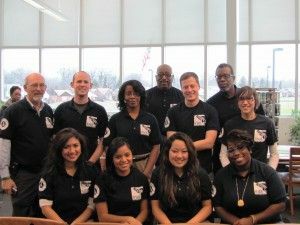 In partnership with the Detroit-based WARM Training Center, 10 full-time AmeriCorps National Service members will serve at DPS schools supporting the DPS Go Green Challenge. AmeriCorps members will work with school Green Teams to implement energy saving projects, assist with utility bill audits and energy audits and conduct community outreach. The program also includes 36 scholarships for DPS high school seniors with 36 part-time summer jobs weatherizing low-income homes in Detroit. The WARM partnership programs are funded with a $242,000 grant from the AmeriCorps National Service Program and this is the first year that all resources are being dedicated to DPS students. Science educators across the district are also working to develop daily PA announcements regarding green programs and energy savings and materials re-use tips that can be undertaken in each school in conjunction with student research projects. Each program in the sustainability plan is designed to have financial, academic, and community health benefits. A Student Transportation bus route efficiency/anti-idling program is designed to cut fuel costs, as well as reduce asthma-related illnesses by reducing emissions. A cost-effective integrated green cleaning and pest-management approach will eliminate use of herbicides and reduce toxins indoors, while helping students and their parents learn about air quality best practices and reducing the overall amount of toxins entering ground water. November 13, 2012 – Lansing, MI – Students from the Detroit Institute of Technology at Cody High School presented findings from an energy assessment of their school at the Great Lakes Place-Based Education Conference on November 13, 2012. With guidance from teacher Ramona Gligor and AmeriCorps members from WARM Training Center, a team of 10 students completed an energy audit of their building during Spring 2012. The team analyzed lighting and appliance efficiency, computer energy usage, cleaning product safety, recycled product usage and overall indoor environmental quality. After completing their analysis, they presented findings to Principal Mary Kovari, the DPS Board of Education, and the school building’s architect. Upon seeing an opportunity to give her students another chance to share their process and findings at the Great Lakes Place-Based Education Conference, Gligor submitted a proposal for the team to present. Once accepted, five students from the original audit team began to rehearse and master their group presentation. On the day of their workshop, despite some pre-presentation jitters, Nakeeta Stanley, Mary Lindsey, Da’Marr Byrd, Keymari Eddings and Antonio Williams delivered a moving and memorable session to workshop attendees. Reflecting on the outcomes of the energy audit process, Gligor noted how the impact of the student learning extended far beyond the boundaries of the project. The presentation was very well received by the audience members, leaving one in particular, thoroughly impressed. Ethan Lowenstein, Director of the Southeast Michigan Stewardship Coalition in Ypsilanti and Professor at Eastern Michigan University, shared some of his impressions in a reflection interview. In the question-and-answer session following the presentation, students all shared that they had increased their career knowledge, expanded job skills, and improved confidence for public speaking. Among the students, Nakeeta Stanley shared heart-fully about the learning that she transferred to family, friends, and neighbors as she took her new knowledge out to the community following participation in her school audit.